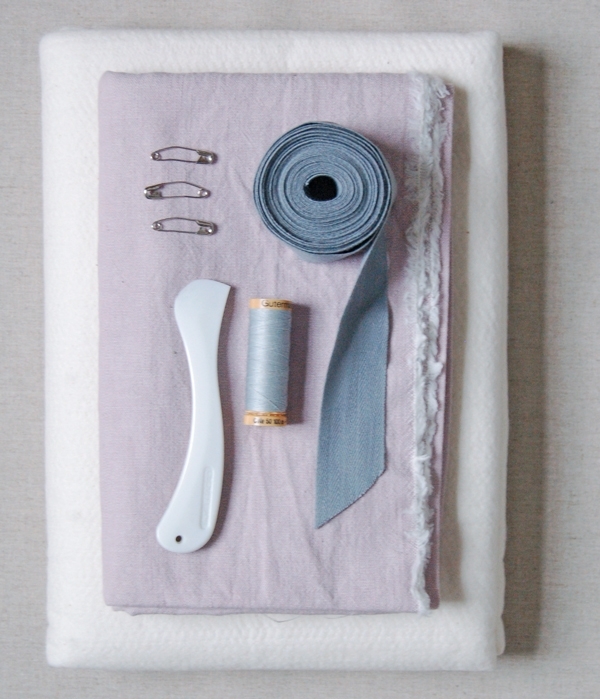 While I was on maternity leave this summer learning how to swaddle, sling and sleepwalk, Purl Soho was busy stocking up on a whole new family of products! 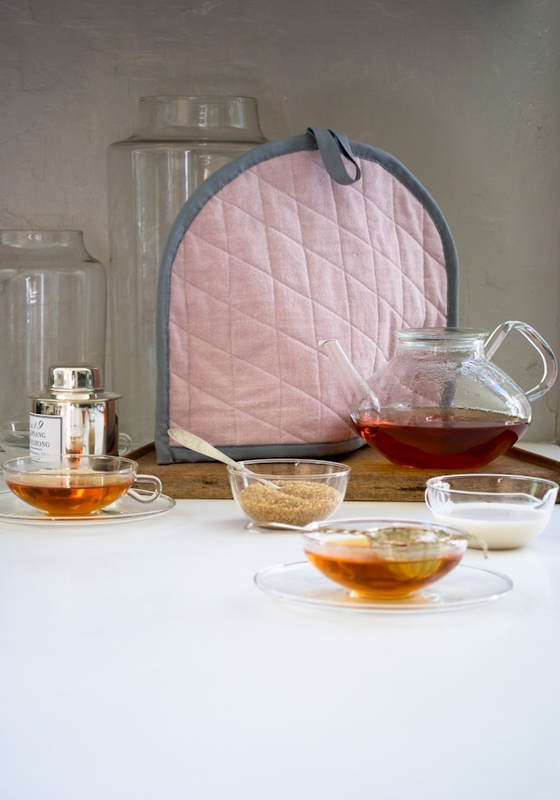 Returning to the store, I was greeted by lots of questions from my co-workers and also by a myriad of exciting new things: a beautiful quilting line from Liberty of London, bags and quilts from Utility Canvas, and most surprisingly, tea from Bellocq! I was so intrigued by its colorful ingredients and handsome packaging, its amazing fragrance and unusual flavors, that I immediately conjured a cozy autumn scene involving a steaming pot of Bellocq tea and me knitting something sweet for my daughter. And while I may not actually get much knitting done this year with a little baby around, I do think I’ll make time for the tea. This lovely Quilted Tea Cozy will keep my pot warm while I answer emails, put away the laundry, and sing “Old MacDonald Had a Farm” for the hundredth time! 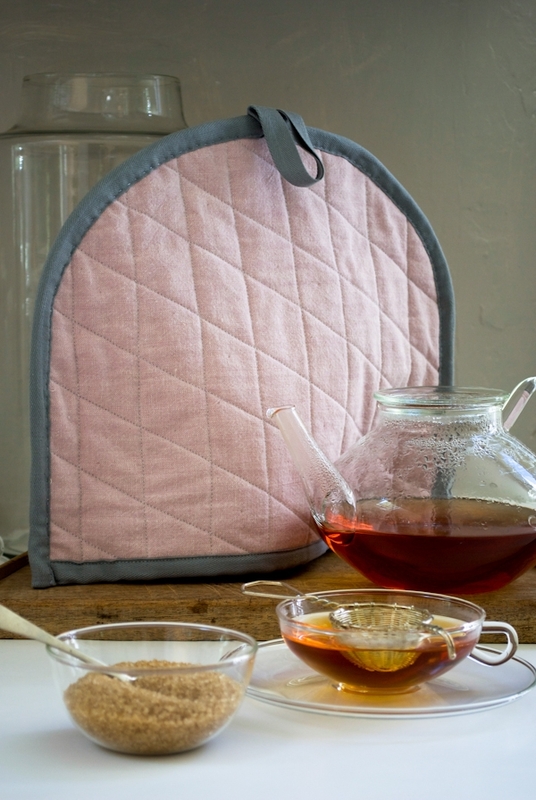 I used the sturdy yet pretty Kiyohara Upholstery Weight solid in Pink, quilted it with thick cotton batting to keep the tea piping hot, and finished it with a smokey gray cotton twill tape. I love this Cozy’s simple elegance and old-fashioned charm, and with a tin of your favorite Bellocq tea, it’s an excellent gift too! 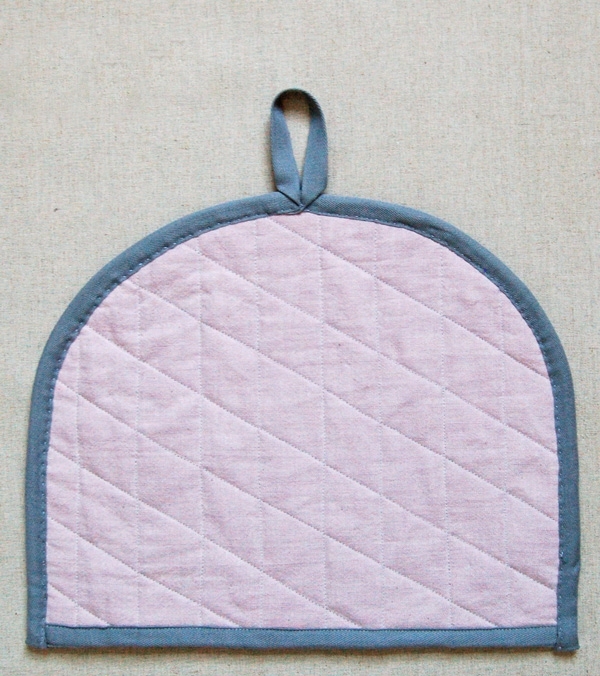 A Tea Cozy template, available for free download here, printed, cut out, and taped together as instructed on the template. 13 1/2-inch wide by 11-inch tall, to fit a 6 cup teapot. 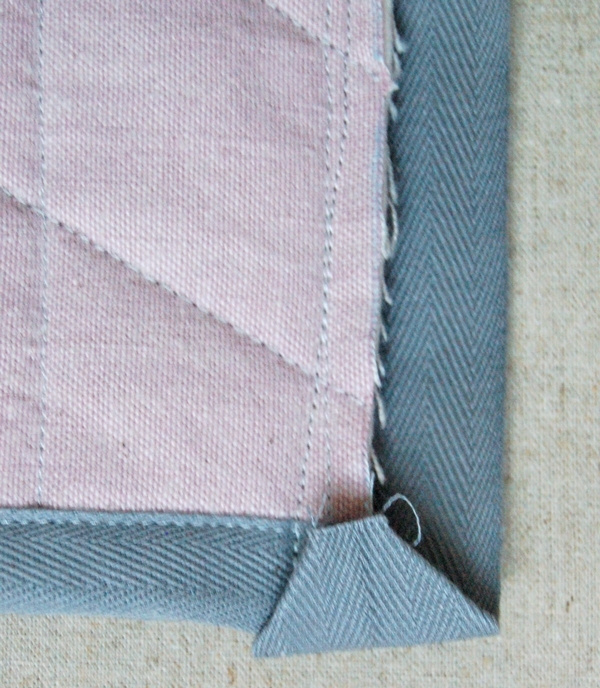 Press the fabric and cut it into two pieces along it’s top fold. 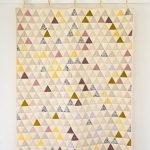 You will have 2 pieces, 22-inches wide by 27-inches long. Cut the batting to be the same size. Tape one of these pieces to a smooth clean surface such as the floor. Stretch it a bit as you tape it so that it is very taught and smooth. Lay the batting on top of the taped piece and then lay the second fabric piece on top of that. 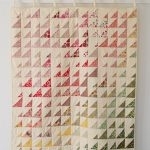 This is your quilt sandwich. Keep the sandwich taped down like this until instructed. 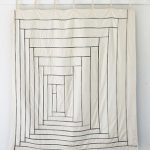 Using your fabric marker mark vertical lines 1 1/2-inch apart from one another along the entire width of the fabric. Then mark lines 60-degrees from the first lines and 1 1/2-inches apart from one another to create diamond shapes as shown above. 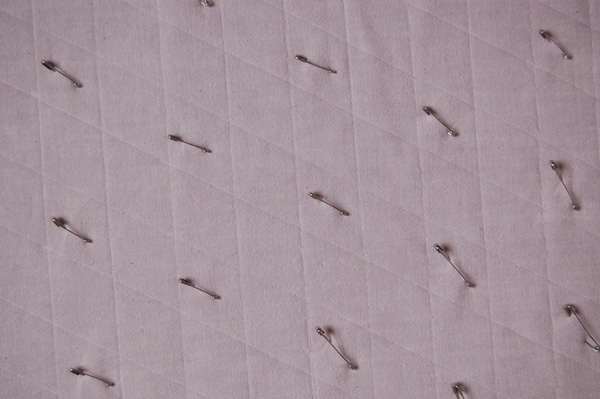 Baste the three layers of the quilt sandwich together every few inches using the curved safety pins. Make sure to pin through all three layers. Untape the quilt sandwich from the floor and remove the tape. 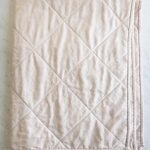 Using your machine’s walking foot quilt along all the marked lines using the light grey cotton thread. 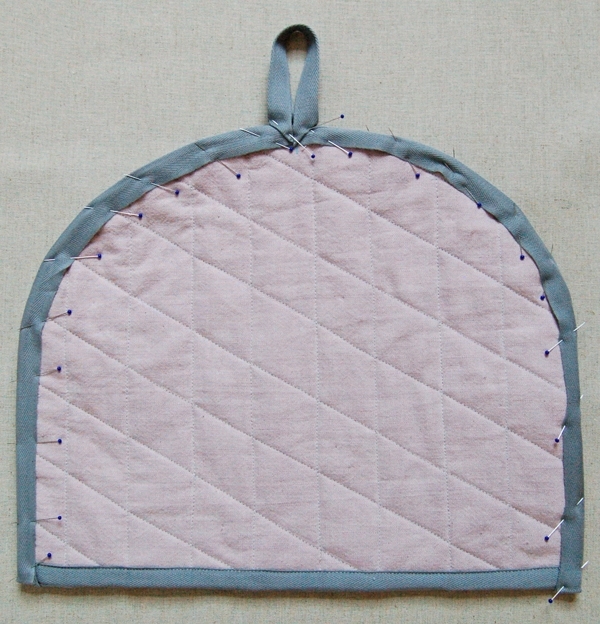 Trace the Quilted Tea Cozy template on your quilted fabric twice making sure the quilting lines are going the same direction on both pieces. Cut the two shapes out carefully. 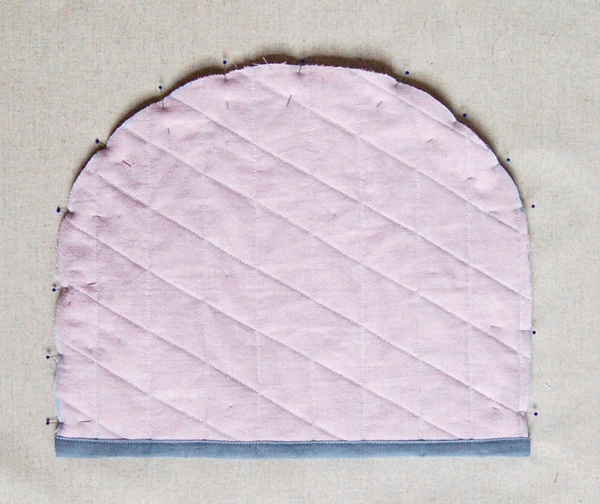 Cut two 15-inch pieces from the twill tape and press them in half lengthwise. 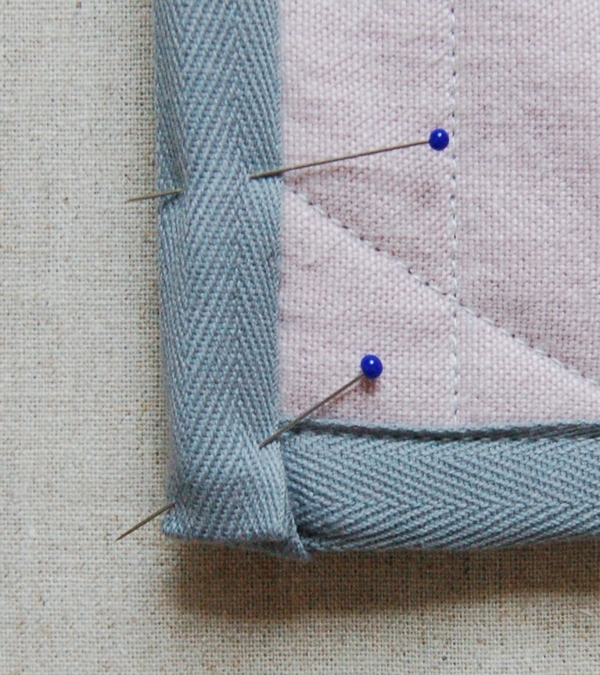 Encase the bottom edge of each of the cut out pieces in the twill tape and pin it on. Using the walking foot sew the tape on along it’s edge. 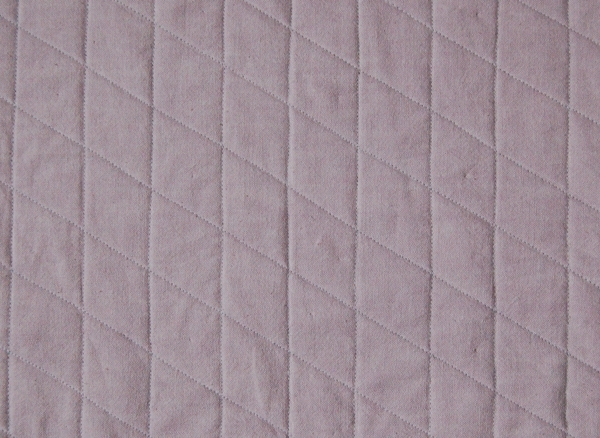 Snip off the loose ends of the tape to match the sides of the quilted pieces. 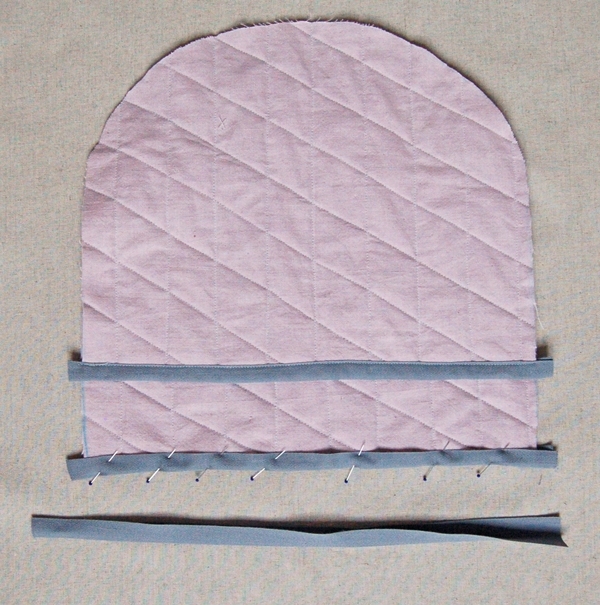 Pin the quilted pieces together along their curves, leaving the bottom open. 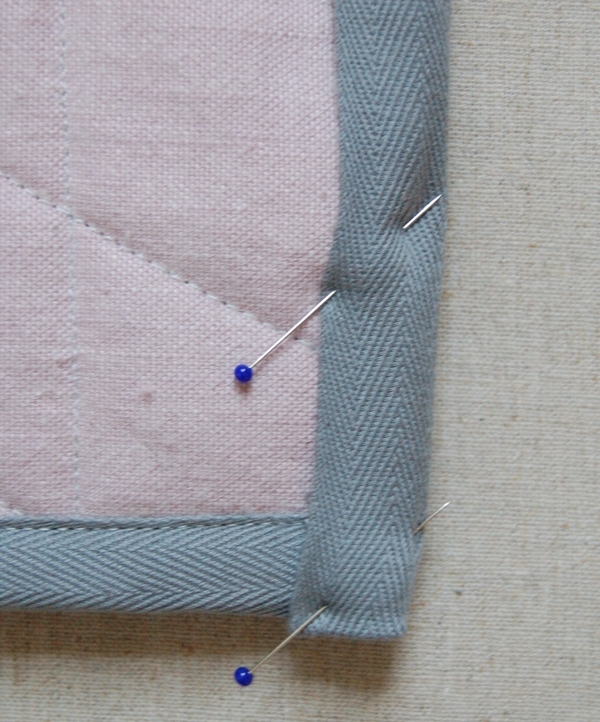 Using the walking foot sew the two pieces together along the curve with a 1/4-inch seam allowance. 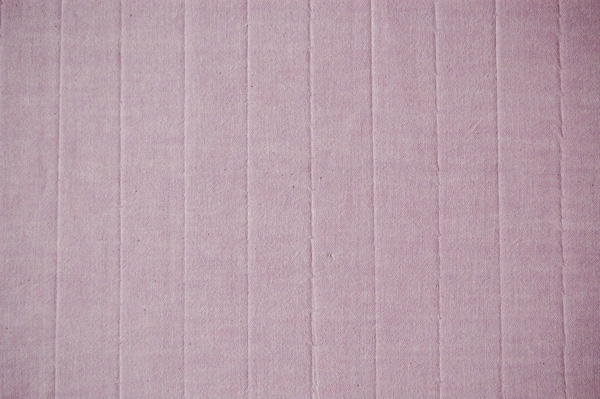 Cut a 36-inch length from the remaining twill tape and press it in half along its entire length. Fold the sides of one of the ends in to form a point and then fold the point a 1/2-inch towards the inside of the fold. 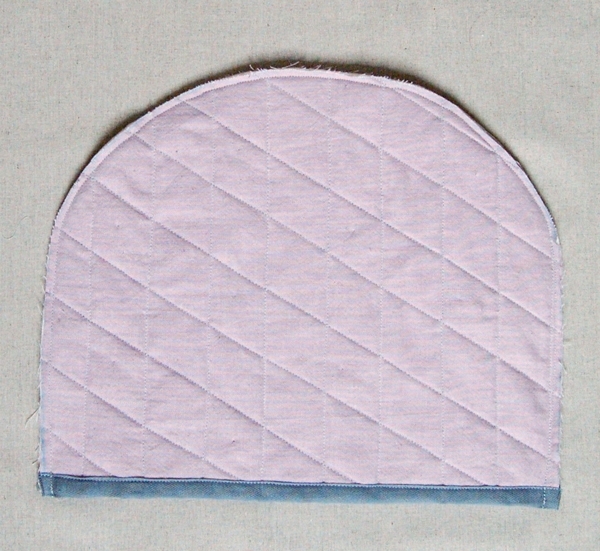 Fold the tape over the right bottom edge of the tea cozy as shown above, with the 1/2-inch fold encasing the bottom edge. Fold the tape over so that it encases the raw edges. Make sure nothing is sticking out at the bottom corner. Pin the tape around the raw edge of the curve until you reach the marking at the top of the curve. 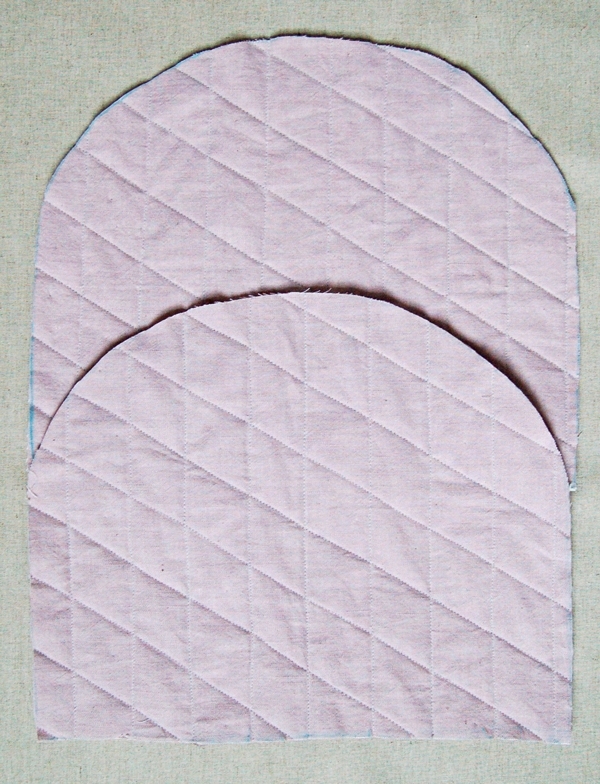 Fold the twill tape over the raw edge of the curve 1-inch past the center marking. 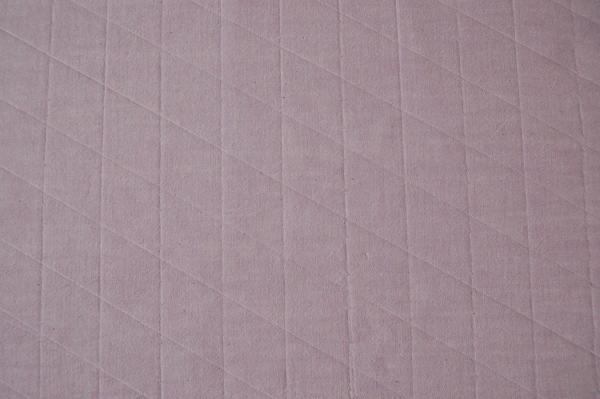 Then fold the twill tape back on itself and pull it up horizontally at the center marking. The tape should make a neat 45-degree angle with itself as shown above. Keeping the tape folded, make a 3-inch tall loop and then fold the tape back down at the center point. The open edges of the tape will be facing each other. 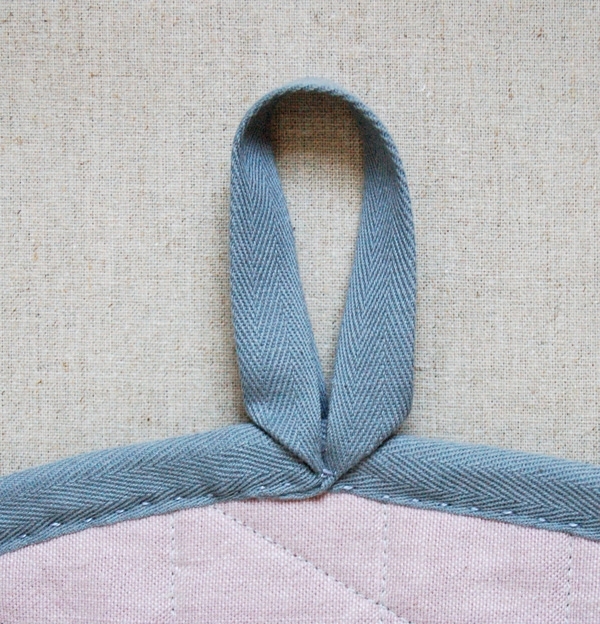 Fold the left side of the loop in the same manner as the right, only with the 45-degree angle facing the opposite direction. 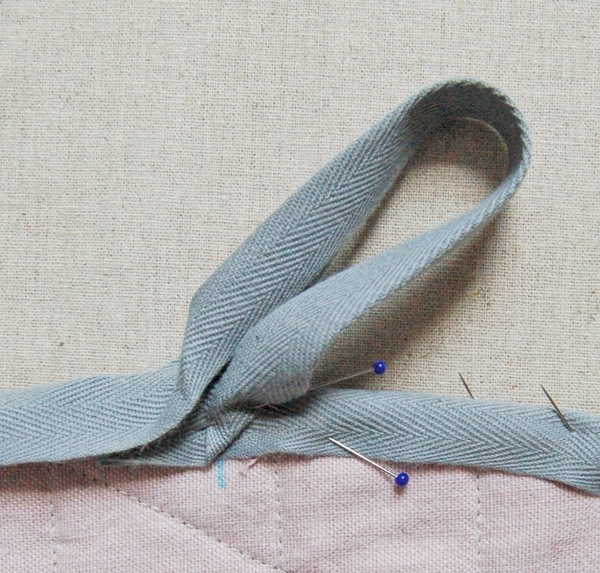 Continue pinning the twill tape along the left side of the curve. When you reach the end of the left curve snip off the excess twill tape, leaving a 1-inch tail. 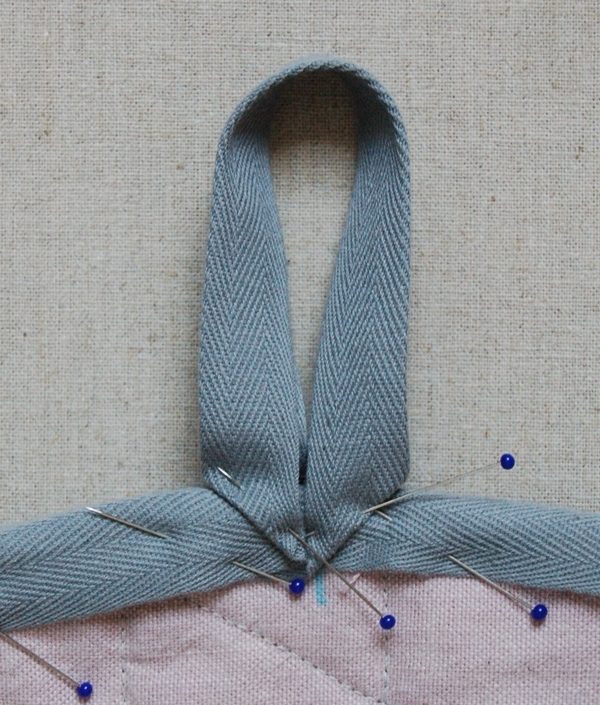 Press the end of the tail in on itself just as you did at the right bottom corner and pin the twill tape shut. 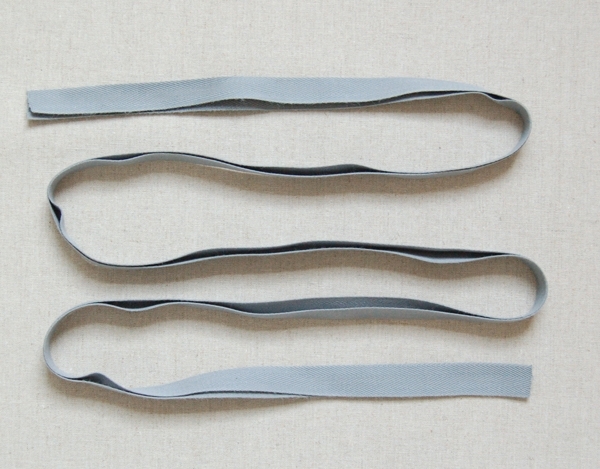 Make sure your twill tape is neatly pinned on all the way around the curve. 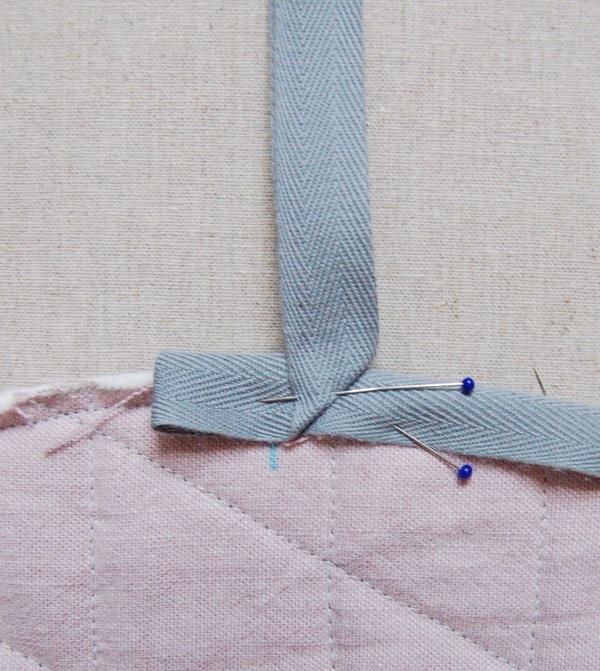 Using three strands of the embroidery floss hand sew the twill tape along the curve with a small running stitch. 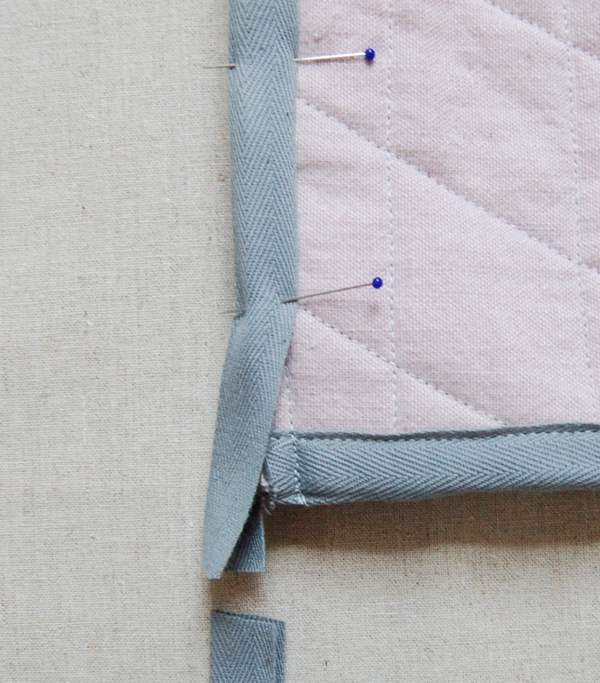 Make sure you are sewing through both layers of the tape and both layers of the quilted pieces. When you get to the loop take a few extra stitches in place at the bottom point of the loop to make sure it will lay flat. 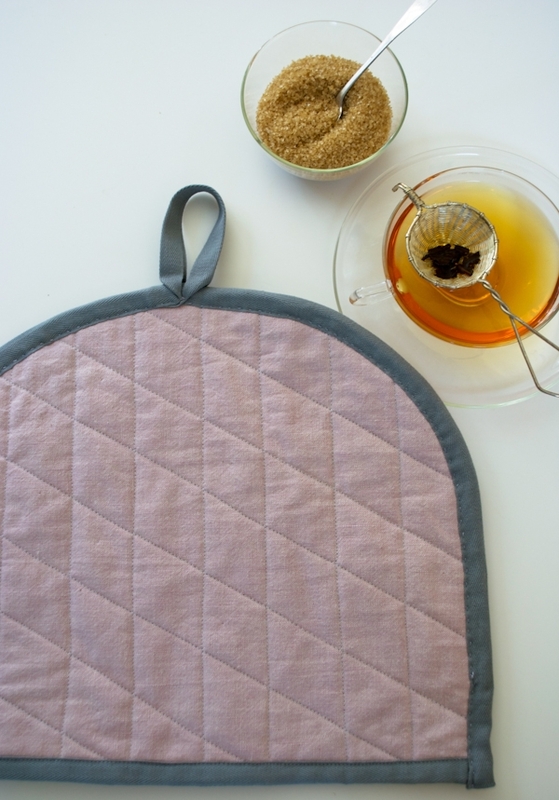 My girlfriend has many tea pots and I want to make her a tea cozy that is easy to sew.